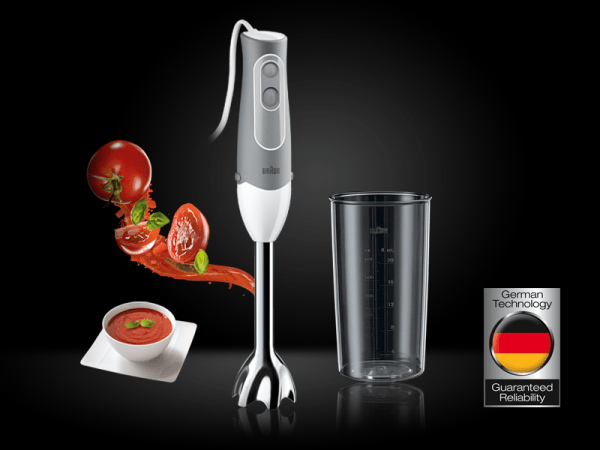 Review: Braun MQ 500 Soup (Hand Blender) – blend your way to a healthy lifestyle! When it comes to the kitchen, I am a big fan of gadgets. Be it tiny little nifty gadgets such as the potato peeler or just handy pots and pans, I like it all. Of course, no kitchen is complete without a decent blender, but they are often hard to clean and every run requires a lot of effort afterwards. Also, if you make hummus as much as I do, you probably know that it can often get ‘stuck’ in a normal blender, as it doesn’t have enough liquids. The solution? Rather simple and cheap, really! A hand blender. Braun recently sent us their multifunctional MQ 500 Soup Hand Blender, which is designed to deal with all kinds of food items, and as the name suggests, it can happily deal with boiling and simmering food too. We took it for a spin (every pun intended! ), so read on to find out how it did. 30% lighter than average blender. With the Braun patented Power Bell – a combination of ultra hard stainless steel blades and a unique blending bell shape. The three parts that come with the device are reasonably packaged. The hand blender itself feels good in your hand, and allows you to hold it in one hand, left or right (for those who are concerned) and allows you to press either button 1 (for normal speed) or button 2 (for turbo speed). Since you have to hold the button to make it work, comfort is rather essential to the design. The stainless steel attachment looks the part and it gives you the confidence that it can deal with almost anything. We tried, and it did, within reason of course. The best part is that you can just pop it in the dishwasher after for a wash, or of course, easily rinse it. The beaker is exactly what it says on the tin, though since this is designed for soups, you can pour both hot and cold food/drink items in it. No real setup is required. Take the bits out of the box, and the attachment just clicks in. A couple of buttons on the side of the blender allow you to remove it too. Simple! Ah, the actual test. I will be honest, while I was testing this, every morning was either a smoothie or a hot chocolate blended with various items in it. It was amazing. The unit is really easy to run, and all you have to do is plug it in, and press one of the buttons. If you think it is struggling a bit, or one of the food items seems to be jumping about, just shift to button number 2, which can deal with anything. I often find dates can be a pain, but this one dealt with them easily and mixed them up. Ice? Oh yeah, that wasn’t a problem either. They were all awesome, and it all worked really well. One of the things I did notice, and this is by no means an issue with the device, is that if you are using it the bell may feel like it is getting sucked to the bottom of the measuring cup or whatever you use this on. This is just an indication of how fast this is running. Normally you can just pull it up, but if there is a problem, just turn it off, and it shall release itself from the sucking vortex! Not many times you can use those words in a literal way! As for soups and curries, of yeah, it worked really well there too! Can I complain? Not really. The biggest issue with almost any kitchen device is how easy is it to clean. Can you pop it in the dishwasher? Does it have tiny annoying bits that food will get stuck in? Most hand and regular blenders suffer from these problems. However, I am happy to report that this one doesn’t. The measuring beaker is reasonably easy, like any other jug or glass. You can give it a quick rinse and leave it in the dishwasher. Similar with the attachment. You can give it a quick rinse and leave it in the dishwasher or just wash it under running water. I did both, and it worked well. Just have to make sure you rinse it otherwise some food items, specially if hot, may get themselves stuck on there and not come off easily. The blender bit itself just needs a wet wipe every now and then. How safe is this? Not very actually. This is a device designed for adult usage, and there are no interlocks or safety mechanisms. You can run the blender with nothing plugged in, and of course, the knives are very sharp. So, please do use this with caution, and if you have kids, don’t leave this plugged in. Of course, stating the obvious but there you go! More information on the Braun MQ 500 Soup can be found on the Braun website. It retails for around £35 and can be bought from various online retailers including Amazon. Previous story Who wouldn’t want a C-3PO?